DIRECTIONS: preheat oven to roast or 550ºF. Wash and quarter kabocha squash or miniature pumpkin, removing stem and seeds. Wash turnips, if using. Coat squash or pumpkin and turnips with a little extra virgin olive oil. Put in a roasting pan or on a baking rack on top of a cookie sheet. Roast about 20 minutes or until done, turning once during cooking. You can also grill the vegetables. Let vegetables cool then slice into chunks, removing kabocha squash or pumpkin from skin. Wash carrots and beets, trim off ends and discard. No need to peel them, shred in food processor or using hand grater. 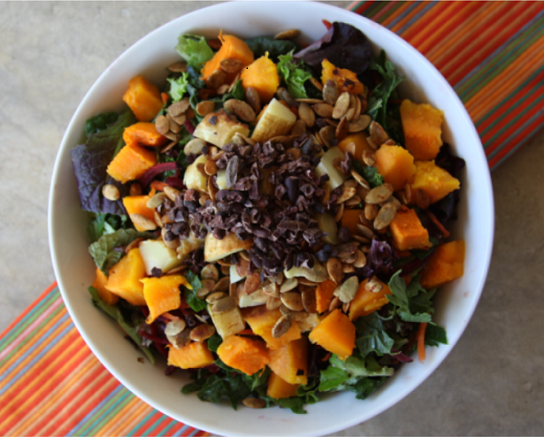 Wash greens and mix with shredded beets and carrots. 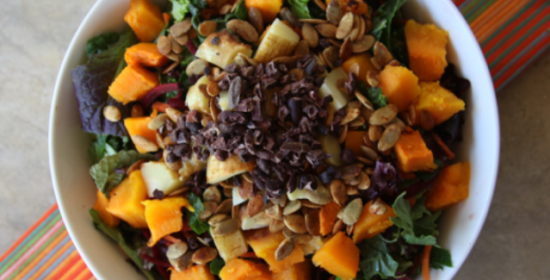 Fill individual pasta bowls with the mix, then top each bowl with kabocha squash or pumpkin, turnips, 1/4C roasted spicy pumpkin seeds, and 2T raw cacao nibs. Serve with homemade salad dressing of your choice. Add a homemade salad dressing of your choice or whisk together extra virgin olive oil and fresh squeezed lemon juice, plus salt and pepper or virgin coconut oil [melted] and fresh squeezed lime juice, plus salt and pepper. Add one teaspoon to one tablespoon of stoneground or Dijon mustard. Optional…add a fresh, pressed clove of garlic. Cacao has been consumed for its invigorating and healthy properties for generations in Mexican, Central and South American cultures. You’ll feel really great about eating cacao nibs, due to the alkaloids theobromine, phenylethylamine and anandamine, the mood boosting, feel good chemicals in chocolate! Cacao is one of the most antioxidant-rich foods on the planet! One of nature’s richest dietary sources of magnesium, cacao nibs are also an excellent source of iron and dietary fiber. Peeled and crumbled from whole cacao beans, crunchy cacao nibs provide pure chocolate flavor. Try them on salads, in smoothies, on yogurt, and in trail mix for a sugar-free alternative to chocolate chips.